Despite Beijing’s concerns, the U.S. couldn’t contain China even if it wanted to. So Philippine and American officials formally inked a basing agreement during President Obama’s visit to the archipelago. Rather than reestablish permanent bases, the deal will allow U.S. military units to rotate through three to five Philippine facilities — the details are still being sorted out — and to stage equipment and munitions there for combat and disaster-relief missions. Huzzah! The complexion of the U.S. deployment will depend on the details — as always, the devil’s lair. Either the American presence will be intermittent as forces rotate in and out of places like Subic Bay or the former Clark Air Base, or, more likely, the U.S. presence will be constant while the units anchoring it change. Fresh forces coming from North American bases will relieve those on station in the Philippines, allowing them to return home to rest and refit. The latter has been the pattern for decades, ever since U.S. leaders decided it was better to keep forces in place along the Eurasian rimlands than to withdraw them after a conflict and return when trouble loomed. The ghost of Douglas MacArthur will confirm how hard it is to return to the Philippine Islands under conditions of extreme duress, and how many lives fighting your way into the theater can cost. Rather than surge from American bases, ships and aircraft undergo upkeep and training, deploy to some regional command for some months, and return home to restart the cycle. Such is the rhythm of American military life. From the standpoint of physical power, then, the U.S.-Philippine arrangement is welcome. It returns U.S. forces to a position along the eastern rim of the South China Sea, speeding up response times and helping them mass force when and where local circumstances warrant. More muddled were the reassurances that U.S. leaders winged Beijing’s way. It’s a familiar repertoire: rejuvenating the alliance with Manila isn’t about China; Washington has no desire to contain China; etc. Lather, rinse, repeat. Is it true that alliance management has nothing to do with China? No. Let’s not insult our Chinese friends’ intelligence. They’ll believe their lyin’ eyes before they believe soothing words out of Washington. 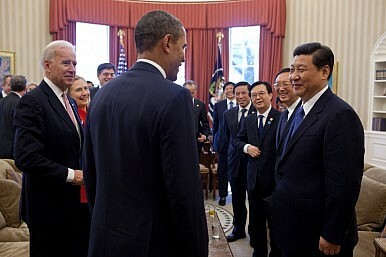 Then is it really true that the United States has no desire to contain China? Yes. Containment is a Cold War word, applied to an ideological foe bent on subverting its neighbors and, over time, spreading the delights of Marxism-Leninism across the globe. (Says the former denizen of Cambridge, Massachusetts, the Kremlin on the Charles.) As a strategy, containment meant rendering political and economic assistance to nations bordering the Soviet Union, helping these nations help themselves. Thus emboldened, they could withstand Soviet blandishments on their own. Or at least that’s how George F. Kennan, the father of containment, envisioned it. Or there’s the more militant strain of containment associated with Paul Nitze. Nitze headed a team that compiled NSC-68, calling on the United States to rearm following its post-World War II drawdown. Only thus could the West face down the East. But even the NSC-68 framers, with their emphasis on martial means, agreed with Kennan on the nature of the challenge and the basic logic of the Western reply. If the West could contain Soviet expansion, it would sap the revolutionary fervor from the Eastern bloc. Over time the Soviet empire would mellow into something the West could live with. Or it would fall. Thud. Neither paradigm fits China especially well. If Beijing is about to go on the march, it has concealed its intentions exceptionally well. So with apologies to Johnnie Cochran, if the analogy doesn’t fit, we must acquit. And yet… China evinces no desire to subvert its continental neighbors, still less to foment revolution throughout the world. But it is trying to expand at sea, appropriating islands, atolls, and waters within the China seas. Spokesmen explain that China exercises sovereignty there, meaning a monopoly of force within national territory. Water is territory from an official Chinese standpoint. How do you respond to that if you’re sitting in the Oval Office, Foggy Bottom, or the Pentagon? Well, Washington and its allies may find themselves compelled to accept Beijing’s interpretation of what the sea is — territory to be governed, rather than a commons open to all — if they’re to resist Chinese efforts to purloin waters and land features within Asian states’ exclusive economic zones. Redefining coastal states’ EEZs as “blue national soil,” to borrow the Chinese phrase, would clarify matters. It would show that the Chinese fishing fleet, the China Coast Guard, and the PLA Navy are guilty of old-fashioned cross-border aggression when they pierce into the Philippine EEZ at places like Scarborough Shoal and expel the Philippine Navy and Coast Guard — agents of the rightful sovereign — from national maritime territory. This is an unpleasant conclusion to reach, I grant you. It amounts to accepting China’s repeal of Hugo Grotius’ idea of the free sea — the doctrine on which the international maritime order is founded — within the China seas. John Selden’s vision of the closed sea would prevail there. But accepting China’s terms would show Asian nations they must band together to repel aggression — whether of the terrestrial or watery variety. In so doing, Washington, Manila, and other Asia-Pacific capitals can send a signal of resolve — bolstering their chances of deterring Beijing. The Chinese Communist leadership may find itself forced to settle its maritime territorial quarrels by negotiation or other nonviolent arrangements — the same way it settled most of its border disputes on land. Now, if not containment, under what banner can we rally a coalition against a bullying central power? I’ve got it: let’s call it the entente cordiale!